We recently spent 4 glorious days on the island of Čiovo, located just off the Croatia mainland next to the beautiful town of Trogir. The island is in the center of Croatia’s Dalmatian coast and it is our third trip to the Croatian coast and each time I like it more and more. 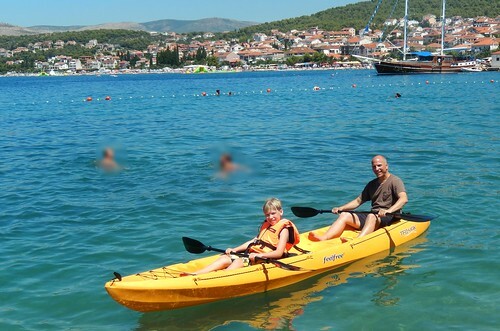 The highlight for me was renting a sea kayak for an afternoon with Owen. It was a great way to spend the day with my son. 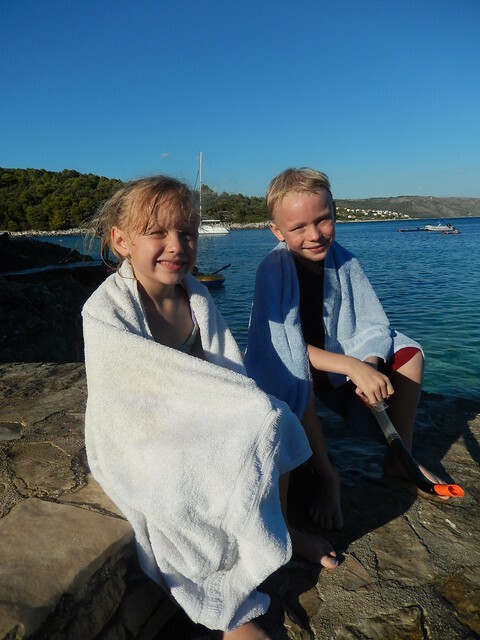 We paddled out of Okrug Gornji and found some secluded coves that were perfect for “cliff diving” and swimming. I can see the allure of the Adriatic Sea. The turquoise water, that Mediterranean bright sun, the smell of pines and sea, and the white limestone rocks, really renews one’s soul. We spent most of the time on the beach because the kids couldn’t get enough of the water. 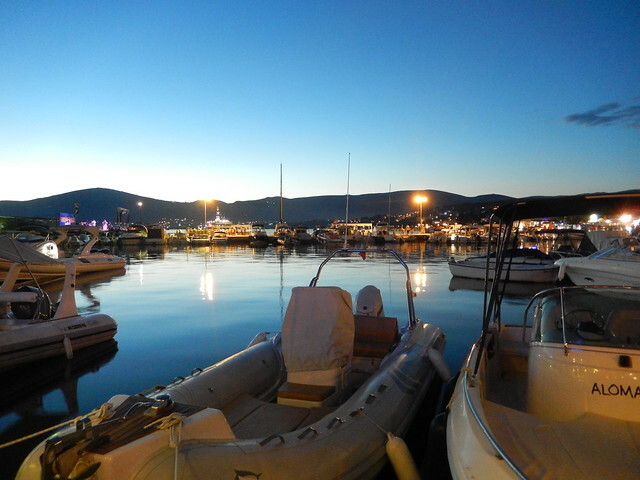 In the evenings we enjoyed fresh fish dinners and took the ferry over to the mainland Trogir for ice cream. The town is an UNESCO world heritage site and it was pleasant to see the yachts in the harbor and meander through the old city in search of ice cream. There were a lot of tourists, mostly from Germany, Poland and other northern European countries. There were enough places to get away however and it didn’t feel that crowded. We stayed on Čiovo because our good friend, Nemenja, his mother is originally from there and they have a summer home there. 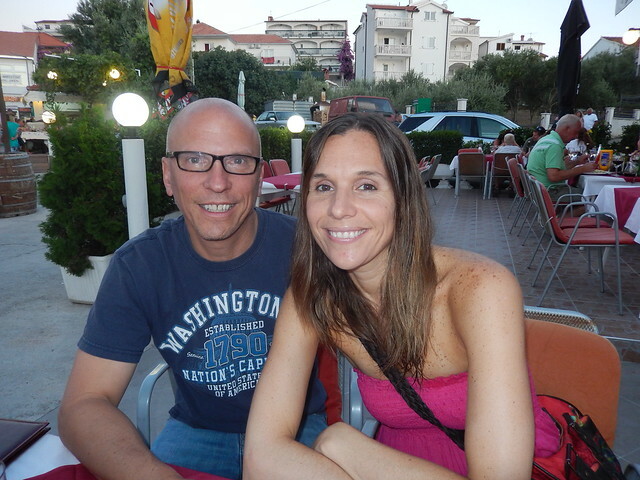 He and his family showed us some typical Balkan hospitality and made our stay even more wonderful. I want to thank Dragica, Milena, and especially Nemenja for showing us the secrets of Dalmatia. I would bet the Croatians have an ambivalent attitude towards the crowds of tourists. Most locals have gotten into the rental business and converted their homes into apartments. The tourists also bring lots of revenue to the supermarkets, restaurants, ferries, shops, etc. They have changed the character and physical look of the place however, and it was interesting to hear Nemenja’s description of the town pre-tourist boom. There were very few Serbs around, and that stems from still ill feelings of Croats towards Serbs from the war. A bit inland is the former Serbian enclave and short-lived independent country (Republic of Serbian Krajina), Knin. A lot of violence occurred there and it would be a fascinating place to visit. The city went from being 79% Serbian to 75% Croatian. Serbians usually go a bit further south to the Montenegrin coast. We did get quite a few looks because of our licence plates. Croatia was celebrating their recent membership to the EU (July 1) and I am closely watching the impact on the country. Serbia is in the process of membership and so I am curious to see what benefits and disadvantages EU membership brings. I learned that the Dalmatian breed of dog is not common in Dalmatia. The breed was originally from there, used as a guard dog for nomads, but the breeding and popularization of Dalmatians took place in England. The unofficial capital of Dalmatia is Croatia’s second city of Split. I would like to go and visit there. I also did not understand much of the Croatian language. They have a different accent and in this part of Croatia, they mix in a lot of Italian and Croatian terms that differ from Serbian. For example, they do not say prijetno, but dobar tek instead. We will definitely be back to Dalmatia. It is seven hours from Belgrade via a fast, four-lane highway, although it goes in a roundabout way and not a direct route. Someone needs to put a large, straight highway from Belgrade through both Bosnia and Montenegro. Travelling through those countries is an uncomfortable and slightly dangerous experience due to the winding narrow roads.